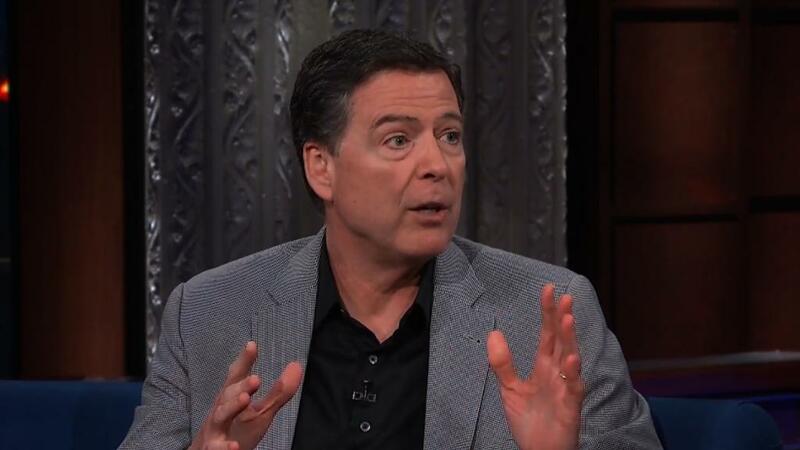 Former FBI Director James Comey sat down with Stephen Colbert on Tuesday for a wide-ranging interview that touched on President Donald Trump, the Russia investigation and...red wine. "When you were fired, you say in the book that when it was over, you flew back on a plane to the east coast drinking Pinot Noir in a paper cup," Colbert said during a Tuesday afternoon taping of CBS' "The Late Show." He then pulled out the bottle of wine and two paper cups and made a toast with Comey. "To the truth," he said. CNN was granted exclusive access to the taping of the interview, which is set to air in late night on Tuesday. "The Late Show" is Comey's latest stop in his book tour for "A Higher Loyalty," a new memoir that offers insight into his termination as FBI director by President Trump. The book, which officially went on sale Tuesday, is shaping up to be one of the biggest best-sellers of the year. Comey's publisher printed 850,000 copies to meet the expected demand from buyers. "Of all the people to be fired by Donald Trump, my guest tonight is definitely one of them," Colbert said when he introduced Comey, who walked out on the CBS stage to a standing ovation. The two talked for more than 30 minutes with Colbert kicking off the conversation by asking Comey for his loyalty and if he has insight into the Russia investigation that isn't public yet. "Can you tell me?" Colbert asked. "Okay, drink some more wine," Colbert said. The conversation moved quickly and culminated in a lightning round of questions. "What happens if [Special Counsel Robert] Mueller gets fired," Colbert asked. "Does the investigation go on?" "I think most likely it goes on. I think you would need to fire everyone in the Justice Department and the FBI to stop that investigation," Comey replied. "I think it would be very hard to shut that down by firing [Mueller]." "Well, it's hard to fire the FBI director, too," Colbert said. "The Late Show" had some fun hyping the interview by tweeting out a mock promo earlier this week that parodied ABC News' ads for its exclusive sit-down. Colbert's promo used footage from Sunday's ABC interview and put Colbert in the seat of anchor George Stephanopoulos. It billed "The Late Show" conversation as Comey's "first interview since that other interview" and had Colbert "ask" Comey questions like "You have to choose one superpower. Is it invisibility or flight?" and "Are you a cop?" Comey will continue with his book tour on "The View" on Wednesday, "The Lead with Jake Tapper" on CNN and MSNBC's "The Rachel Maddow Show" on Thursday and he will participate in a CNN town hall on April 25. Colbert's relentless mockery of the Trump administration has helped him top his rivals in TV ratings by a sizable margin. Ratings reports on Monday showed that Colbert averaged 4 million viewers in the first quarter of 2018, which amounts to a 20% spike compared to 2017 and a staggering 1.2 million more viewers than rival Jimmy Fallon. With numbers like that, it's not likely that Colbert is going anywhere. An audience member on Tuesday asked him ahead of the taping if he could have any job in the Trump White House, which one would he want. "I don't think I'd be a good president, but I'd be a better president," Colbert said. "Just nothing in HR." Correction: This article originally misstated the date of CNN's town hall with Comey.